"Security"…2 Have or Not 2 Have that is the ??? I have run across men/woman old/young that are simply NOT happy with their lives. Some of them it could be their marriage/relationship that brings upon this unhappiness; however, it also ranges as far as not being happy with their LIVES in general (Jobs, bills, friends, family) and the LIST GOES ON. At the end of the day all of this UNHAPPINESS falls back on a lack of security within themselves and MOST IMPORTANT the lack of SECURITY they have in JESUS. I remember (BC=B4 Christ) Monisha would fall apart when my husband (previously my son’s father) and I would break up (In our teenage yrs…MANY MANY yrs ago LOL) or have ISSUES in our relationship, I would feel like my life was over. You…..YES YOU know what I’m talking about that feeling you get in your stomach…COME ON YOU KNOW. I remember being let go from a job once and I felt like OMGoodness what am I(YES I SAID I) going to DO. You see my SECURITY wasn’t in the Lord CLEARLY if it was I would have been saying LORD YOUR WILL BE DONE. 1 Peter 1:5 “Security lies not in our doctrines of men nor in the flesh of men but in the power of God”. I personally know people that transition from the world to Christ that feel if the people they loved when they were in the world are not “FEELING” their walk with the ALMIGHTY KING THAT DIED FOR THEM they will fall BACK into their sinful nature to PLEASE these people. Examples: Your husband/Wife, Boyfriend/Girlfriend or your Sister/Brother or your Best friend what we have to KNOW is WE GAVE OUR LIVES TO CHRIST and their lives in the WORLD will continue but WE have to have the SECURITY in Christ to KNOW I MEAN…..KNOW that WE as believers ARE NOT missing out on ANYTHING that this world has to offer. We have the responsibility to PRESS FWD for Jesus and be that EXAMPLE that those people NEED TO SEE DAILY. Our security SHOULD NOT be in THESE PEOPLE but in Christ and Christ ALONE. The (WC=With Christ) Monisha doesn’t CONCERN herself with being a people PLEASER I ONLY want to PLEASE God. Therefore, I can honestly tell you ANYTHING that gets in the way of my SPIRITUAL GROWTH with MY God I will say AWAY WITH IT!!! & I MEAN ANYTHING/ANYONE. I WILL NOT surround myself around anything/anyone that I feel will STUNT my spiritual/mental GROWTH with Christ…NO, I haven’t ARRIVED (STILL HAVE A WAYS TO GO) with God so I have struggles TOO BUT my security SURELY doesn’t rely on my Husband, my kids, family, friends, jobs, or THINGS. Therefore, in your SECURE walk with Christ YOU will find it GOOD for the people to be DISTANT because it will give you the chance to have a CLEAR MIND for Christ to work on you. The Security THRU HIM that you WILL receive in that TIME ALONE is UNEXPLAINABLE BUT AWESOME. When our SECURITY is WEAK He will CONTINUE to KEEP us STRONG as long as we REMAIN IN His WILL. HANG IN THERE….as my sister claire told us on Monday…. 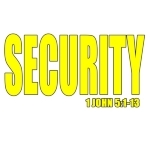 Today find your EVERLASTING security in the Lord….His SECURITY will NEVER give you that UNEASY feeling in your stomach. TRUST ME but MOST IMPORTANT TRUST GOD!!!!!! This entry was posted in Fridays with Monisha and tagged bold, boldandfab, christ, fabulous, Fridays with Monisha, God, secure, security. Bookmark the permalink. 16 Responses to "Security"…2 Have or Not 2 Have that is the ??? Loved it! It really feels like you can read heart. This friday was for me an my security. Thanks for the morning inspiration too. Slam dunk once again Mo! Love it! Love my Bold and Fabulous sister in CHrist!! My favorite part of your post is: “WE as TRUE believers ARE NOT missing out on ANYTHING that this world has to offer.” You ain’t NEVER lied homie. Thank you for your word today!! That was my favorite part too Indigo! It took me a while to realize it but it’s true!!! Thanks for sharing Mo! GREAT JOB WIFEY!!!!! Dont know WHEN u find the time…..BUT you gets is DONE babe….. True Happiness is found only in absolute security, which is found only in CHRIST… excellent points, sweetie! Keep using her, Lord! Some people look at you in life and the way you act toward them and get upset with you, I have been a straight shooter all my life, letting my feeling speak out loud and clear, one thing I know is that I speak the truth, so saying this my strength has been in God and the security he has installed in me over my life, know one knows the relationship that you have with God, so why do so many people try to judge you on the way you act, if you have the strength that God has put in you, you can move forward with your walk with Christ, he will never leave you nor forsake you. Keep your SECURITY ALIVE WITH GOD. The Bible promises a place of safety beyond what most Christians experience. I believe it is possible to experience the protection of God the way King David did. I long to experience God this way. I am sure that you do also. So keep your Security in God, he will never leave you. Why Understand Security in Yourself Better? We are caught in a cycle. The result of filling our desire for God—apart from Him—is a complicated mix of pride, insecurity, shame, fear, unwanted behaviors, damaging reactions, and deeply painful memories of being hurt by earthly disappointments. The better we understand ourselves and our need for God, the more effectively we can deal with the obstacles that keep us from Him. It is time to break out of the cycle! It is time to turn and feast on God! “Understanding Yourself” is practical evidence why you should believe God will draw near to you intensely enough that earthly sources are no longer nearly as much of a distraction. Mo, I love very much and (KEEP LOOKING TO THE HILLS FROM WHICH COMES YOUR HELP, YOUR HELP COMES FROM THE LORD THE MAKER OF HEAVEN AND EARTH)!!! Moe I truly love this post it rang so many bells with me. thanks for sharing this reminder with us. I feel TRULY BLESSED that God used me to ENCOURAGE all of you…..I pray that you took ONE THING or MORE and adjust it into your DAILY WALK!!! Stay Encouraged in Jesus Name…. Reblogged this on The BOLD & The FABULOUS. Great word, sis! So many overlapping messages for God’s people to keep the faith and trust in Him. I feel wobbly on my young legs in Christ at times, but knowing that my only true security, peace and satisfaction comes from Him keeps me right under His covering. You’re right. I no longer get that uneasy feeling in my stomach. Love you, sis!